Every year, the Quilters create a quilt for charity to be raffled at the Islay show. To date we have raised over £12,000 for local causes! This year’s design is a striking and colourful piece with Islay at its heart. Tickets are available for just £1 from The Shop in Islay House Square, from members, or on Show Day itself. It’s a fantastic opportunity to own a piece of Islay history, as well as raise money for local causes. 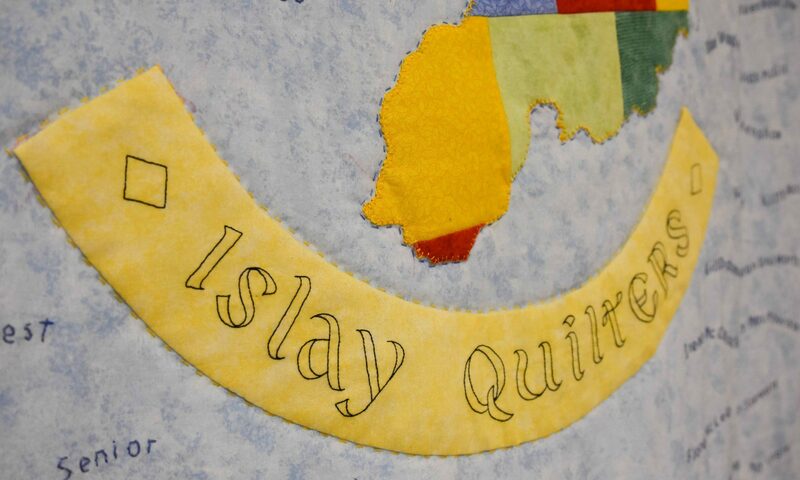 When the Islay Quilters were formed, one of the ideas that seemed to be in everyone’s mind, apart from learning new techniques and having fun, was to make a quilt each year to raffle for a local charity. This is now something that we have done every year (except 1997), raising very welcome and useful sums of money to help local Islay and Jura charities. The pattern for the charity quilt is chosen by all the members of the group and is always a majority decision. Group members bring along a pattern they like and they are laid on the table for discussion. Over the years we have tried many different types of patterns, ranging from hand-pieced tradition to machine-pieced contemporary. We all have our own personal favourites!